Posted on August 11, 2015 by Barry V.
After finishing up with the orchids, I head back to the car and dry out my feet as best I can before heading over to the West Mountain Wildlife Sanctuary trail head on Prospect Street. As I’m assembling my gear to hike the trails, I hear a commotion in the woods across the street, and a young bear pokes its head out of the thick roadside vegetation and looks straight at me! I must look threatening because the animal makes a hasty retreat back into the woods, only to circle around and do the same routine again! The bear clearly wants to cross the road, but after its second retreat it must have decided to cross elsewhere. The bear was not a cub, but about the size of a German shepherd, and I paused to consider whether its mother might still be attending it. The fact that it made so much noise in the woods was re-assuring, since it would be unlikely to take me by surprise if I encounter it again. 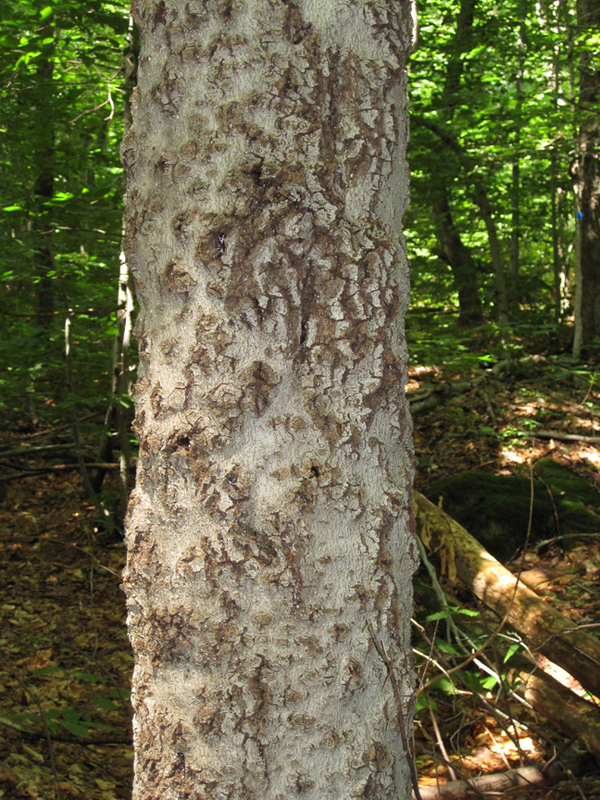 Hiking the East Slope Loop Trail I notice that many of the beech trees are suffering from beech bark disease, and I later read on the orientation panel that this disease is contributing to the decline of beeches in the area. Attractive lady ferns line the trail, and in some places the forest floor is covered with a thick growth of hobblebush shoots. 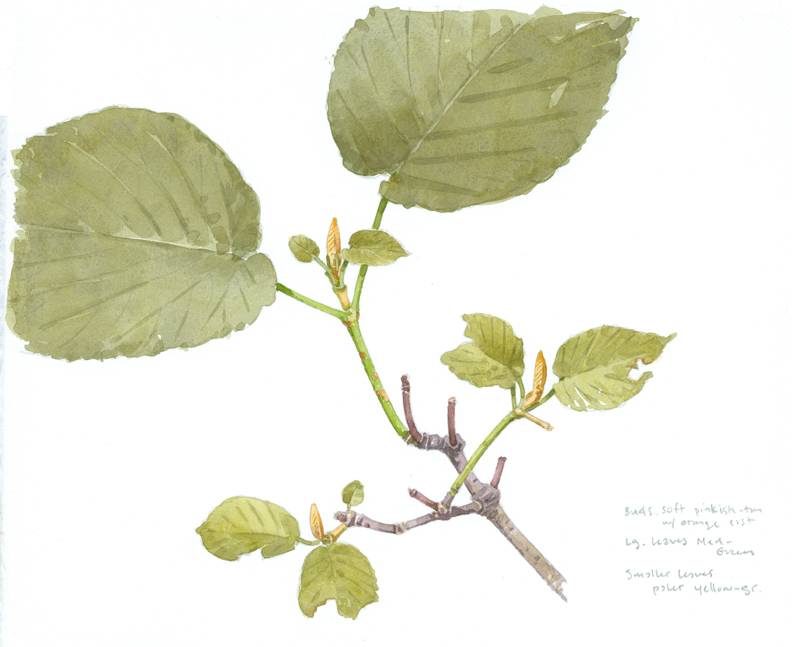 I stop to make a watercolor study of the hobblebush, since I love the soft orangey-tan buds, which rise like candle flames from the tip of each twig. I’m also intrigued by the way the color of the new wood is distinctly different from the old. 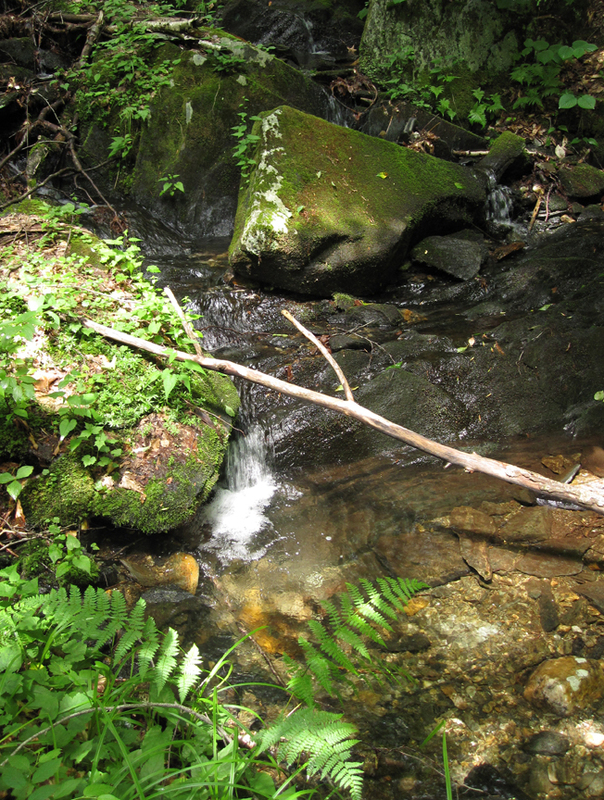 The trail follows alongside two lovely, tumbling brooks and through a hemlock forest – where I’m serenaded by black-throated green warblers and hermit thrushes. 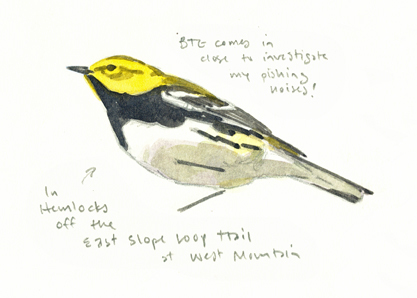 This entry was posted in Artists, Barry Van Dusen Residency, News, Wildlife Sanctuary and tagged Barry Van Dusen, bear, Beech bark disease, black bear, black-throated green warbler, East Slope Loop Trail, hermit thrush, hobblebush, Museum of American Bird Art, Orchids, Plainfield, Watercolors, west mountain wildlife sanctuary, Wildlife Sanctuary on August 11, 2015 by Barry V..